(Photo: WCC / Peter Williams)World Council of Churches General Secretary Rev. 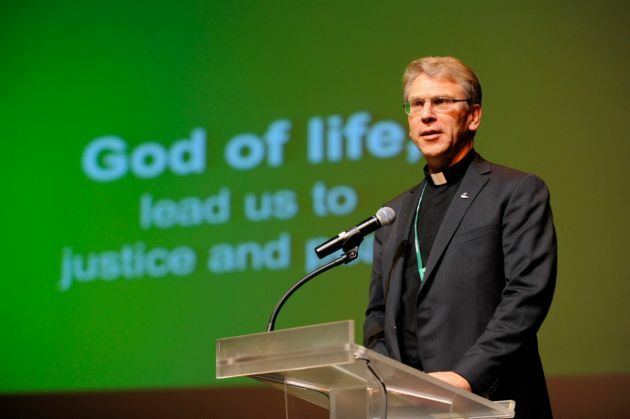 Olav Fykse Tveit on the opening day of the 10th WCC Assembly in Busan, South Korea on October 30, 2013. BUSAN, South Korea - The world is at a time when the life of God's creation is more at threat than it has ever been, the top official at the World Council of Churches has said. "The globe cannot carry the sum of all the developments and the crises that are present and those which are likely to come," said the general secretary of the World Council of Churches, Rev. Olav Fykse Tveit. Speaking on the opening day of the WCC 10th Assembly in Busan, South Korea on Wednesday, Tveit said. "So many things point to crisis: the overconsumption of energy resources, the devastating effects of emissions into our common air and atmosphere, the natural disasters that are made worse due to these effects." He cited the exploitation of nature as humanity consumes more energy as well as food and fresh air. At a WCC assembly the church grouping of some 560 million Christians holds about once ever seven years, the path for the international body that seeks Christian unity is mapped out. Tveit noted that many human beings are marginalized and excluded from the life of the world economy. "Many of the poor are becoming even poorer. Affairs cannot continue like this. We know all this from recent reports of the U.N. climate panel, and other reports; many of you know it from your own experiences." Still he noted that there a signs of a new dawn for a world that does have hope. "Fully 2.1 billion people have received access to clean drinking water since 1990. The world produces three times as much food now than it did 30 years ago. Millions have been lifted out of poverty. Many diseases are being cured," said Tveit. He also said there are signs of shrinking amounts of serious violence and killings compared to centuries past. "There are fewer wars between nations and more cooperation and communication among human beings. We can communicate with one another more and more quickly than ever, as one humanity." Regarding a unity of faith, Tveit said, "God is creating for us a worldwide ecumenical movement, building on our experience of a real but not yet full unity in our faith and life." Tveit and Rev. Walter Altmann, moderator of the WCC's main governing body, its central committee of the WCC reported to the assembly. Tveit called on fellow Christians to participate in the work of the "new day," and he said, "God is creating a new day for the worldwide ecumenical movement, building on our experience of a real but not yet full unity in our faith and life. The dawn comes by the tender compassion of our God of life." Tveit commented on the recent developments and crises around the world, speaking specifically about Syria, Palestine and the divided Korean peninsula. As Damascus was an alternative venue for the 10th general assembly, Tveit called on the World Council of Churches member churches to seek out "just peace." "Just peace is a dimension of this biblical attitude of solidarity and accountability. It represents an ethical shift in which justice and peace are inseparable facets of a holistic way of life. "We are particularly called as a world community of Christians to be in solidarity with those who live where the history of our faith has its roots." The World Council of Churches has a new mission statement, based on the work of the Commission on World Mission and Evangelism. The mission statement has received recognition and support from many churches including Evangelicals, Pentecostals and Roman Catholics. Tveit explains, "To be missional is to be a church in solidarity with those who are marginalized in different ways. In fact, mission is defined by and comes to us all from the margins." Tveit also acknowledged that the World Council of Churches has struggled with funding and resources in recent years. These challenges, said Tveit, have allowed the World Council of Churches "to become more focused on the impact of programs, better to coordinate program and relationship building work."